One of India’s youngest startup unicorns is about to dive headfirst into the country’s already-crowded grocery delivery market. Swiggy is testing out Swiggy Dash, a separate app that will perform hyperlocal grocery deliveries, and squarely take on players like Big Basket and Grofers. The app is already being tested internally, and is expected to be launched over the next couple of weeks. 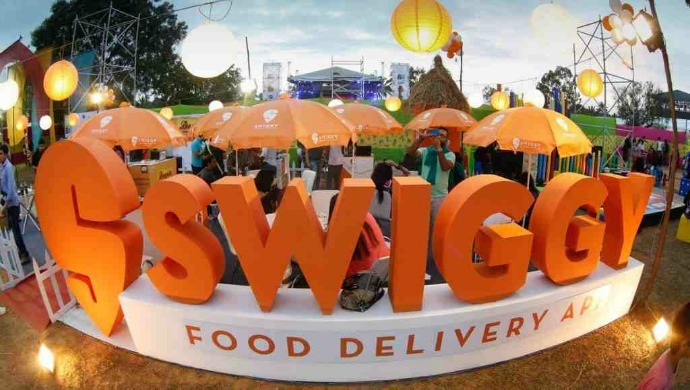 Swiggy Dash will first be launched in Gurgaon, where Swiggy has already partnered with several supermarkets. 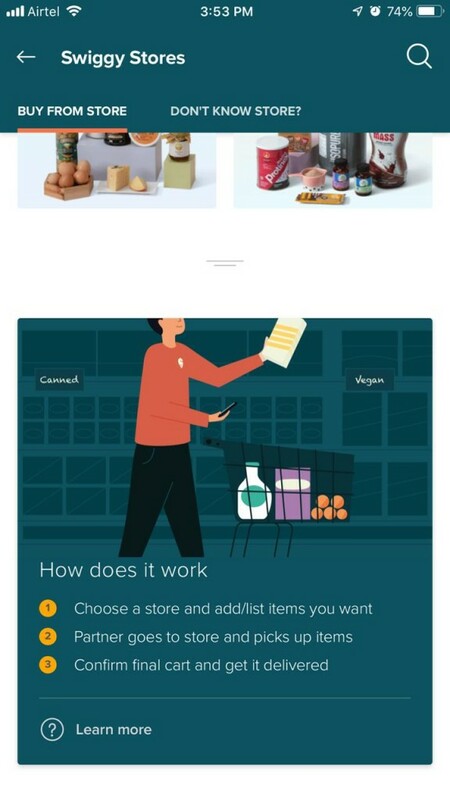 As screenshots obtained exclusively by OfficeChai show, Swiggy Dash will allow users to pick a supermarket or grocery store, and add available items to their carts. Much like how a Swiggy delivery person picks up the order from the restaurant, a Swiggy partner will go to the store and pick up the ordered items. Users will then be able to confirm the final cart and get their orders delivered. Swiggy Dash appears to have signed on several stores in Gurgaon for its pilot, and lists a whole range of products. 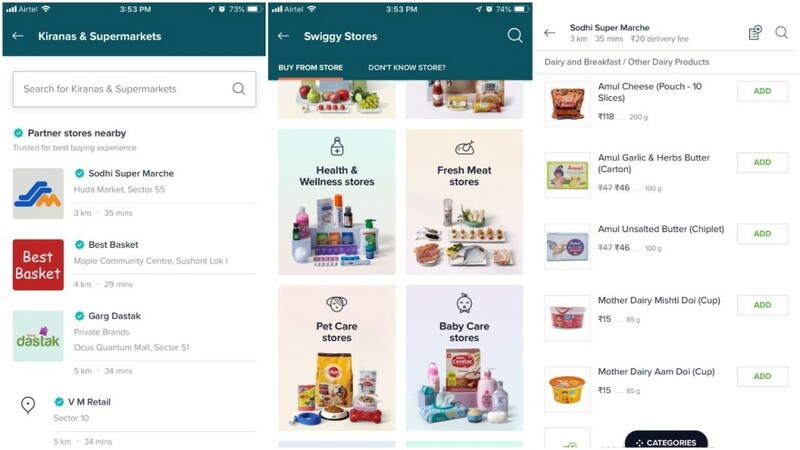 Swiggy Dash will allow users to buy everything from groceries, to meat products, to baby care products and even pet supplies. Under a particular store, Swiggy lists out individual items that can be purchased, much like Grofers and Big Basket. It’s yet unclear what the delivery charges are going to be, but deliveries up to 4 kms are expected to be free, and other deliveries could have charges depending upon the distance from the store. Swiggy Dash, once it is launched, will enter a crowded field of grocery delivery apps, most prominent among which are Big Basket and Grofers. Hyperlocal grocery delivery is a space that has seen some strife in the past — in 2016, several big players including Flipkart and Ola had shut down their grocery delivery arms, and PepperTap had also shut shop. These companies had failed to make profits in an industry that already had razor-thin margins, and only a few players had managed to survive. In this backdrop, Swiggy will have its task cut out. Its initial app launch suggests that it won’t hold any inventory in its warehouses, and will only deliver items from existing stores. This could make it hard for the company to eke out profits, even if it does charge a delivery fee. But Swiggy has several years of experience in delivering food across Indian cities, and likely has some spare capacity in terms of delivery partners. If it can use its existing fleet to perform grocery deliveries as well, it could well end up using some of the economies of scale that its existing food delivery operations provide. And Swiggy is flush with funds as well. It became a unicorn just last year after having raised $210 million (Rs. 1,500 crore), and likely has some spare cash to start its hyperlocal delivery operations. It’s also possible that hyperlocal might just be a start — if its experiment is successful, it could branch out into other forms of delivery, and perhaps even start a concierge service of its own, much like Dunzo. But for now, Swiggy Dash appears to be starting off with grocery delivery, and if the launch works out, could well ending up creating a whole new vertical for other food delivery apps in its cohort. If Swiggy can create a successful hyperlocal delivery product after having started off with food delivery, it’s not inconceivable that Zomato, Foodpanda and UberEats might want to follow suit, and that could heat up India’s grocery delivery space in a way that few would’ve imagined just a few years ago.